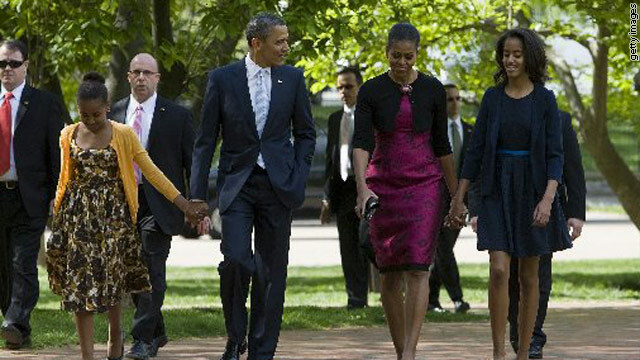 The Obama family decided to keep it local Sunday morning, walking just across Lafayette Park to St. John’s Episcopal Church for Easter services. “Happy Easter, everybody” the president said on the way to church, holding hands with his younger daughter Sasha as he walked by the press pool. During the service the Rector, Rev. Dr. Luis Leon spoke about the mystery of Easter and the resurrection, comparing it to the global economy, neither of which he said he understands. "You ruin it if you try to explain it," he said. "It can't be explained." 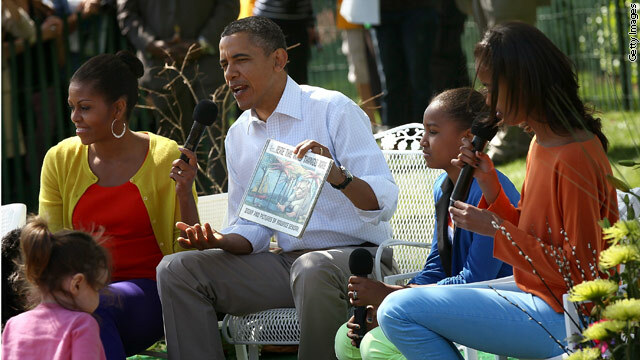 Music from a sound check ahead of Monday’s Easter egg roll could be heard on the White House North Lawn as the Obama family walked back from services. Unfortunately this writer is not hip enough with the tween scene to recognize the artist. 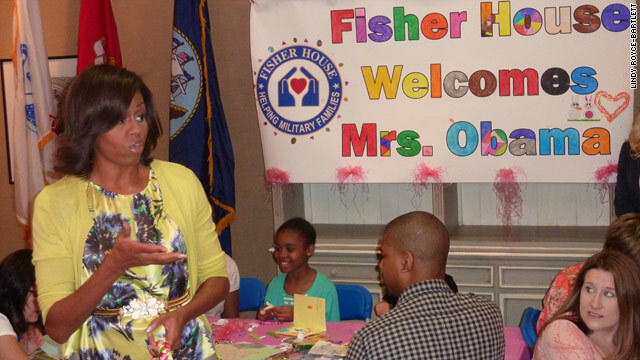 Easter came early for some of the military families at the Fisher House at Walter Reed National Military Medical Center in Bethesda, Maryland. And, it was First Lady Michelle Obama who came bearing pastries from the White House. Bo, the first dog dressed in bunny ears accompanied the first lady on her visit. The Fisher House is a refuge for veterans and their families as they receive medical care at Walter Reed. On Wednesday, 19 of those families took part in making arts and crafts, with the first lady on hand to spend some time chatting and signing autographs. The families are among the 73 that live on the premises at Walter Reed, there are 57 Fisher Houses across the country in total. Wednesday’s event is a part of Mrs. Obama’s campaign to bring recognition and support to military families. It’s been a year since the First Lady and Dr. Jill Biden kicked-off their “Joining Forces” initiative, and next week the two will hit the road on a two-day tour (which will include an appearance on the Colbert report, while in New York City) to celebrate its one year anniversary. 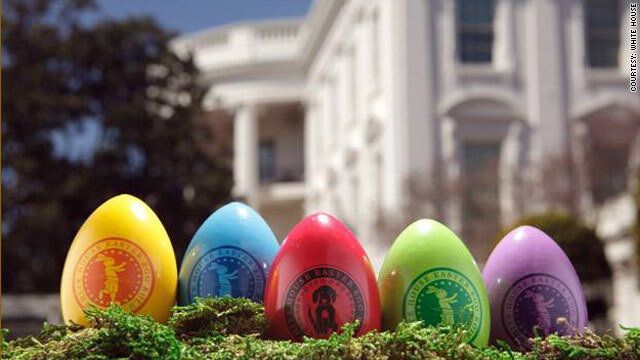 As she departed Mrs. Obama bid everyone adieu until Monday, when they will gather again, amongst many other revelers, for the annual Easter Egg Roll on the White House South Lawn. 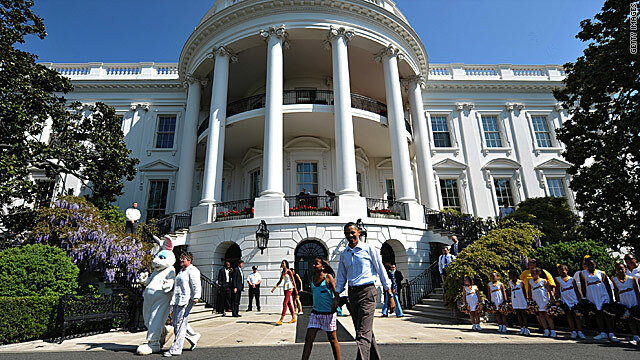 WASHINGTON (CNN) – With the Easter Bunny at their side, the first family opened up their backyard to 30,000 people from all 50 states for the annual action packed Easter Egg Roll on Monday. “Everybody ready? Everybody feel good about their form,” the president asked the young contestants a few minutes later just as he blew the whistle to kick off the egg rolling competition. 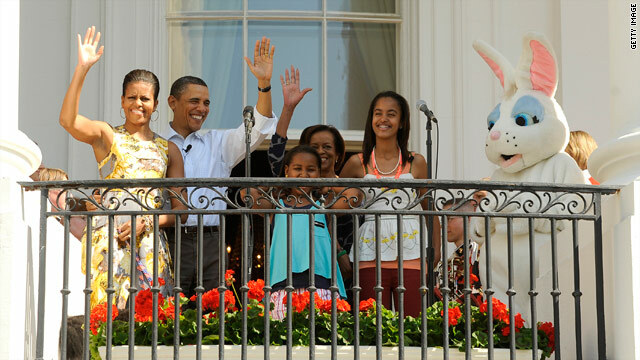 Malia and Sasha joined their father as he high-fived the eventual winner of the first race, and posed for pictures along with the Easter Bunny and Mrs. Obama.